The C-5 is one of the largest aircraft in the world. - Able to take off fully loaded within 8,300 feet (2,530 meters) and land within 4,900 feet (1,493 meters). - High flotation landing gear with 28 wheels sharing the weight. - Nose and aft doors that open the full width and height of the cargo compartment to permit faster and easier loading. - A "kneeling" landing gear system that permits lowering of the parked aircraft so the cargo floor is at truck-bed height or to facilitate vehicle loading and unloading. - Full width drive-on ramps at each end for loading double rows of vehicles. - A system that records and analyzes information and detects malfunctions in more than 800 test points. 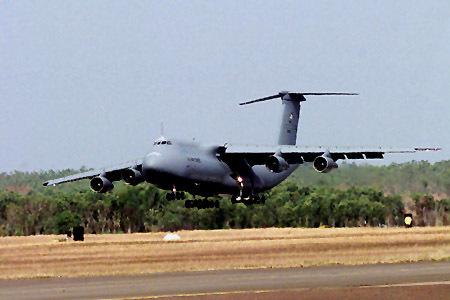 The C-5 is similar in appearance to its smaller sister transport, the C-141 Starlifter, although the C-5 is much larger. Both aircraft have the distinctive high T-tail, 25-degree wing sweep, and four turbofan engines mounted on pylons beneath the wings. The Galaxy carries nearly all of the Army's combat equipment, including such bulky items as its 74-ton mobile scissors bridge, from the United States to any theater of combat on the globe. Four TF39 turbofan engines power the big C-5, rated at 43,000 pounds thrust each. They weigh 7,900 pounds (3,555 kilograms) each and have an air intake diameter of more than 8.5 feet (2.6 meters). Each engine pod is nearly 27 feet long (8.2 meters). The Galaxy has 12 internal wing tanks with a total capacity of 51,150 gallons (194,370 liters) of fuel -- enough to fill 6 1/2 regular size railroad tank cars. A full fuel load weighs 332,500 pounds (150,820 kilograms). A C-5 with a cargo load of 270,000 pounds (122,472 kilograms) can fly 2,150 nautical miles, offload, and fly to a second base 500 nautical miles away from the original destination -- all without aerial refueling. With aerial refueling, the aircraft's range is limited only by crew endurance. Lockheed-Georgia Co. delivered the first operational Galaxy to the 437th Airlift Wing, Charleston Air Force Base, S.C., in June l970. C-5s are stationed at Altus AFB, Okla.; Dover AFB, Del. ; and Travis AFB, Calif. AMC transferred some C-5s to the Air Reserve components starting with Kelly AFB, Texas, in 1985; followed by Stewart Air National Guard Base, N.Y.; and Westover Air Reserve Base, Mass. In March 1989, the last of 50 C-5B aircraft was added to the 76 C-5As in the Air Force's airlift force structure. The C-5B includes all C-5A improvements as well as more than 100 additional system modifications to improve reliability and maintainability. All 50 C-5Bs are scheduled to remain in the active-duty force, shared by comparably sized and collocated Air Force Reserve Associate units. Based on a recent study showing 80 percent of the C-5 airframe service life remaining, AMC began an aggressive program to modernize the C-5. The C-5 Avionics Modernization Program began in 1998 and includes upgrading avionics to Global Air Traffic Management compliance, improving navigation and safety equipment, and installing a new autopilot system. Another part of the plan is a comprehensive re-engining and reliability improvement program, which includes new engines, pylons and auxiliary power units, with upgrades to aircraft skin and frame, landing gear and the pressurization system. This modernization program will restore aircraft reliability and maintainability, maintain structural and system integrity, reduce cost of ownership and increase operational capability well into the 21st century.